Wanna know what I did with the Homemade Banana Caramel Sauce I made? I made CUPCAKES with it – best decision ever. 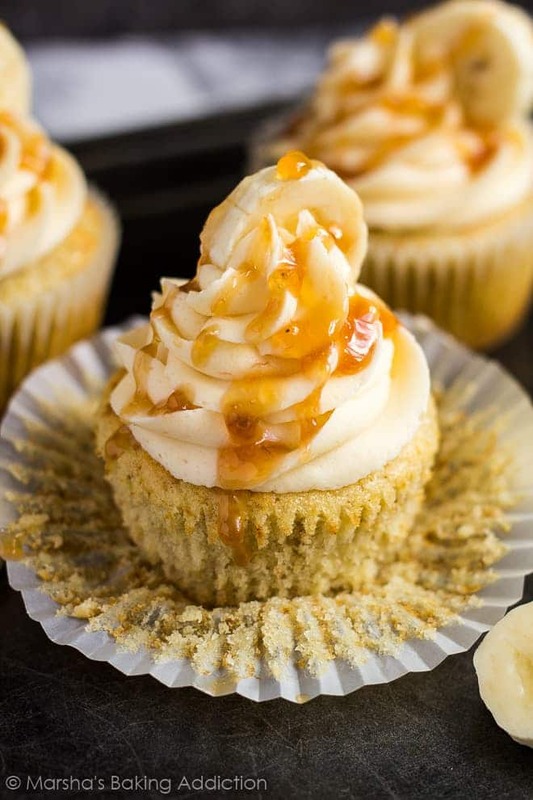 I’ve filled the centres of these cupcakes with banana caramel, as well as added it to the buttercream frosting, and a drizzle on top to finish off. 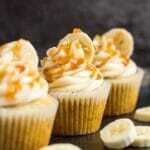 These cupcakes are so deliciously moist and fluffy, and are loaded with banana flavour. 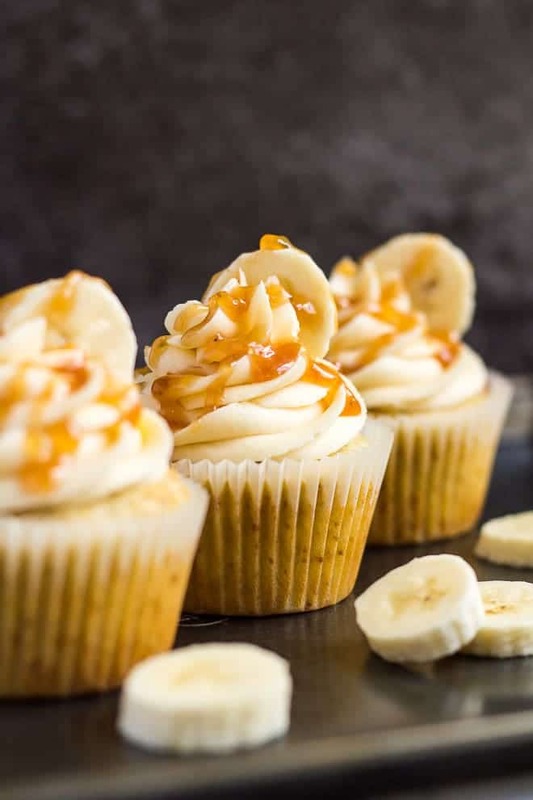 I’ve filled them with my Homemade Banana Caramel Sauce, and topped them with a sweet Banana Caramel buttercream frosting. To finish these off, I garnished them with banana slices, and drizzled them with even more caramel! 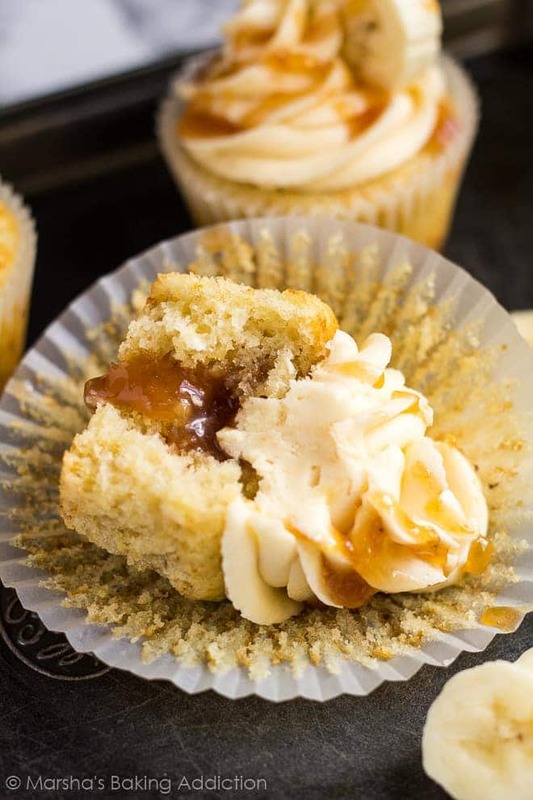 These banana caramel cupcakes are a huge hit with my family, and if you’re a banana and caramel lover, then you are going to LOVE these, too! 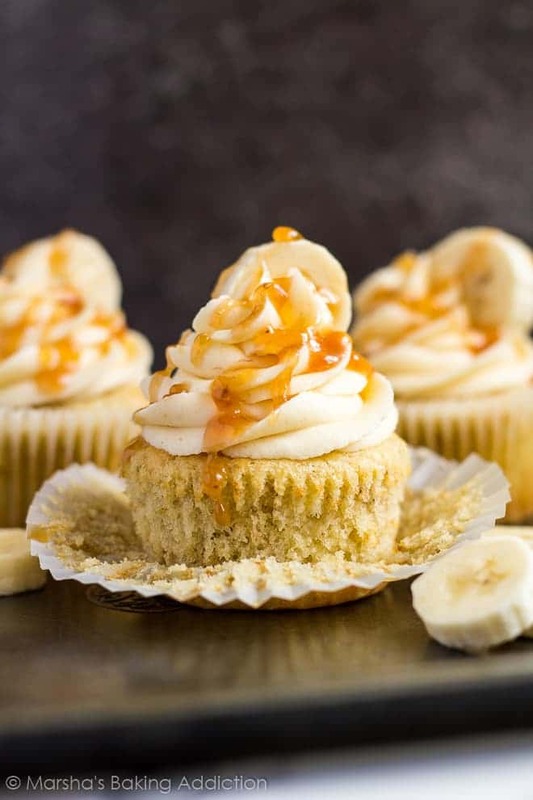 Deliciously moist and fluffy banana cupcakes, filled with homemade banana caramel, and topped with a sweet banana caramel frosting! Preheat the oven to 170C/325F/Gas 3. Line a 12-cup muffin tin with muffin cases, and set aside. Whisk together the eggs. Add the sugar, and whisk until combined. Add the butter, vanilla, yogurt, and mashed banana, and whisk until combined. Fold in the dry ingredients. Bake for 15 - 20 minutes, or until a toothpick inserted into the centre comes out clean. Allow to cool for 5 minutes in the pan, before transferring them to a wire rack to cool completely before filling and frosting. Using a cupcake corer or knife, scoop out the centres of the cooled cupcakes. 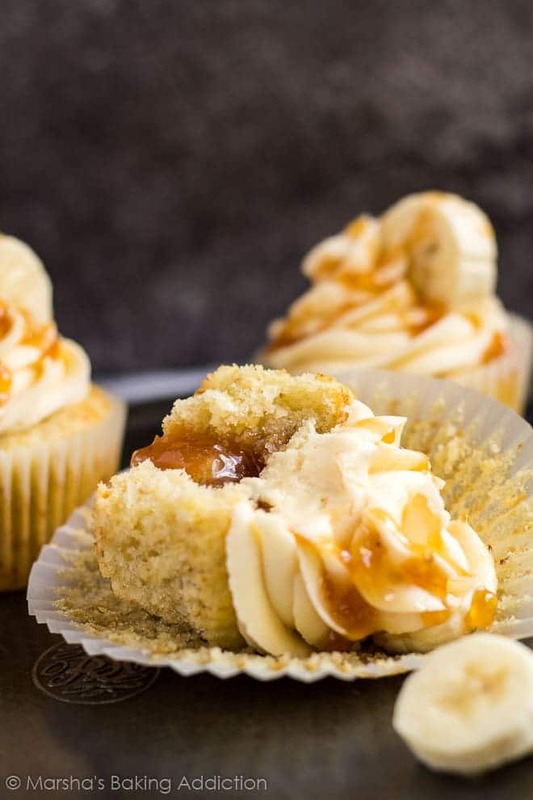 Fill the cupcakes with the banana caramel sauce. Using a handheld or stand mixer fitted with the paddle attachment, beat the butter on high until pale and creamy - about 5 - 10 minutes. Add half of the icing sugar and, starting on low speed and working up to high, beat until light and smooth. Add the remaining icing sugar, and beat, starting on low, until smooth and combined. Add the banana caramel sauce, and milk, and beat on high until light and fluffy. Transfer the frosting to a piping bag, and frost the cooled cupcakes. 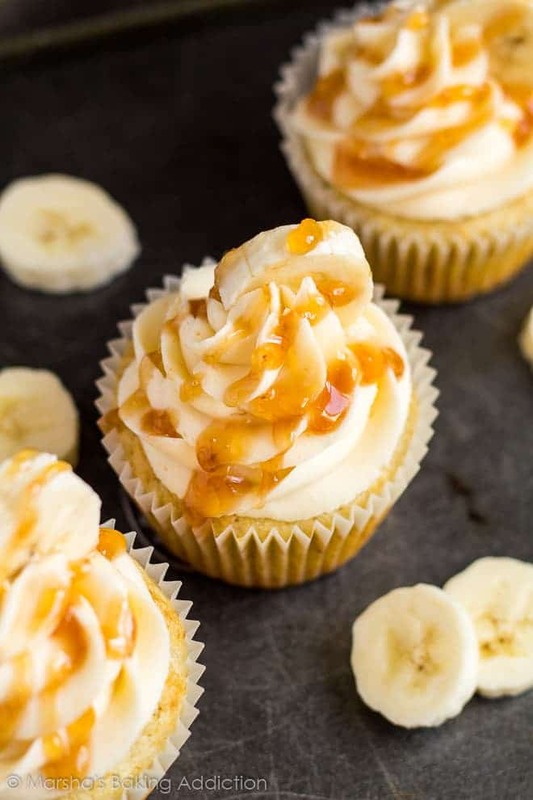 Garnish with banana slices, and drizzle on some banana caramel sauce! 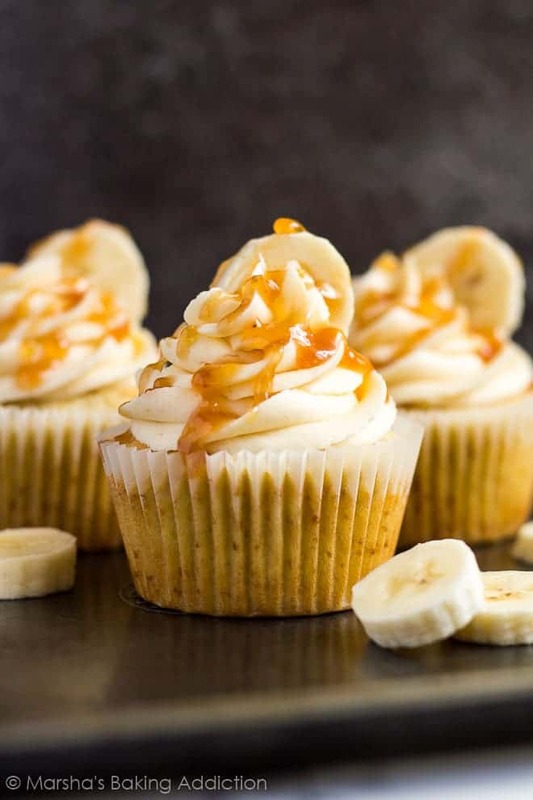 If using my recipe for Banana Caramel Sauce, this makes enough for filling cupcakes, adding to frosting, and drizzling on top with plenty left over. Calories does not include banana caramel sauce. That caramel sauce sounds delicious. And I love it combined with the bananas. Yummm..
Oh my gosh these look absolutely amazing!!! That caramel!! Can’t wait to try this recipe out! This sounds perfect for my daughter’s b-day cake! Is it possible to make this recipe in a cake round? How long would it cook? Yes you can! You may even double the recipe for two 8 or 9 inch cake pans 🙂 I’d bake them for about 25 – 30 minutes until a toothpick inserted comes out clean. how can I get this to yield 6?